Greenpeace action at Siemens - Greenpeace Germany protesters hold a sign in front of Siemens headquarters that reads “Siemens, we want innovation instead of Amazon destruction” in German. Strong opposition, legal flaws and demarcation of land by indigenous communities led to the cancellation of the first of the dam projects on the Tapajós river. Big victory for environmental justice now challenges the future of other projects. On Tapajós river, two major hydroelectric dams are currently under study; São Luiz do Tapajós and Jatobá dams would have respectively a capacity of 6,133 MW and 2,338MW, for a total installed capacity of around 8,500 MW. The Brazilian government plans to invest 18 billion reals (around 5.3 billion US dollars). As one of the central elements of the government’s project to expand hydroelectric power generation across the Amazon, the 8,000-megawatt São Luiz do Tapajós dam is slated to be Brazil’s second largest, after the controversial Belo Monte power plant, which finally began operating in April 2016. Together, the dams would flood 198,400 hectares of land along the Tapajós, including large portions of the Amazonia and Juruena National Parks and the Itaituba National Forests. These dams would have significant impacts on indigenous lands and communities throughout the Amazon, including the Munduruku, Apiaká de Pimental, Akaybãe, Remédio, Sai Cinza, São Martinho and Boca do Igarapé Pacu. Apart from the two major dams, other projects are currently under study on the same river, Jamanxim (881 MW), Cachoeira do Caí (802 MW) and Cachoeira dos Patos (528 MW), Chocorão (3336 MW) e Jardim do Ouro (227 MW). In total, at least 40 more projects are on the way along the river, considered to be the "last frontier" of hydro expansion in the Amazon. Env. Impact Assessments are being carried out by a consortium called “Grupo de Estudos Tapajós”, made up by national companies like Eletrobras, Eletronorte, Cemig, Copel, Camargo Corrêa, and transnational corporations like EDF, GDF SUEZ, Endesa Brasil and Neoenergia (Iberdrola). According to Greenpeace, "the government’s Growth Acceleration Programme (PAC) aims to transform the Tapajós River into an industrial waterway and shipping hub, with the ultimately goal of allowing soybeans produced in Mato Grosso to be shipped to the Atlantic Ocean and onward to foreign consumer markets" . Greenpeace also commissioned an independent analysis of the EIA report prepared by CNEC Worley Parsons Engenharia S. A.1 on behalf of the Grupo de Estudos Tapajós, one of the two consortia currently expected to bid for the contract for the dam. The review found lots of flaws in the process and argued that the public "report on the EIA (known as a RIMA), rather than being a balanced document that could help stakeholders and the general public make up their minds about the proposals, was in effect “a marketing tool that fails to inform society, in an objective manner, about the consequences of the project and minimizes predicted impacts”  These dams were planned when the government expected a rise in energy demand based on growth of 4% a year; however, in 2015 GDP shrank by 3.8% and the projections for 2016 indicate a similar drop, so today it seems that an important obstacle for dam expansion in the Amazon is economic. Moreover, the political crisis currently ongoing in Brazil (June 2016), represents a time of instability and uncertainty of what is going to happen next. Added to this uncertainty, a strategic development law, known as PLS 654/2015, is currently being debated in the senate. If approved, it could significantly accelerate the licensing process, by reducing the environmental protections enshrined in Brazilian law, and eliminating the requirement for public consultation . With an estimated population of 12,000 people spread across 128 villages, the Munduruku are the most numerous indigenous group in the region where the SLT hydropower dam is planned. Other indigenous groups also live in the region, as well as some 2,500 traditional riverside dwellers (ribeirinhos), along with more recent settlers and urban residents. The dam would flood a vast area, requiring the forced removal of at least some indigenous communities, an act that is strictly prohibited by the Brazilian constitution except in cases of disease epidemics or war. Women are also going to bear specific threats to their livelihood and lives, especially due to sell off of land by men, by the in-migration of outsiders for working in the construction sites, the lack of electricity or its high bills . Much of the SLT dam site lies within the territory of the Munduruku people, and the dam will inundate around 7 % of their Sawré Muybu land, including a number of their sacred sites – despite their inalienable rights to their traditional territories and their persistent efforts to have these territories officially demarcated. The Greenpeace report also states that "Although the 1988 Federal Constitution forbids the removal of indigenous groups from their land except in the case of a disaster or in the interests of national sovereignty, the report of the EIA commissioned by the Grupo de Estudos Tapajós ignores this, while quoting a law dating back to the days of the military dictatorship to the effect that “the federal government can intervene in indigenous areas to carry out public works of interest to national development.” It also relies on a discredited map (used a decade ago in an attempted corporate land grab, since thrown out by the courts) to downplay the extent of ribeirinho community land ownership in the area to be flooded." It also warns about other impacts of the projects, such as the increase of mining operations in the area favored by the new roads, and out migration to the closest bigger cities like Itaituba. In April 2016, in a surprising move, IBAMA, the administrative arm of the Brazilian Ministry of the Environment, suspended the environmental licensing process of the controversial São Luiz do Tapajós Dam in the Brazilian Amazon. The move comes just one day after the federal agency for indigenous affairs in Brazil, FUNAI, published a technical report confirming that a 178,000-hectare territory along the Tapajós River, known as “Sawre Muybu,” should be demarcated and protected as traditional lands of the indigenous Munduruku people, in accordance with the Brazilian constitution. The government, influenced by the powerful dam industry, has until now strongly resisted demarcating Sawre Muybu. 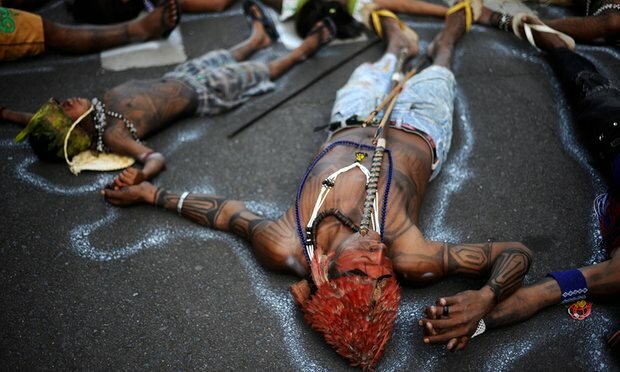 This led the Munduruku, who have been waging a battle against the São Luiz do Tapajós Dam for years, to initiate a process of "self-demarcation" of their territory in 2014 . Demarcation can represent the first step in giving the Munduruku control over their ancestral lands, and for stopping unnecessary mega projects. UPDATE 04.08.16 - Ibama has decided not to give an environmental license to the São Luiz do Tapajós hydroelectric dam, the first of a series of dams planned for the Tapajós river basin. According to Sue Brenford in Mongabay, "In the past, the federal government has argued that it was not required to give this protection to the 170,000 hectares (656 square miles) of Sawré Muybu land, as it was not formally recognized as indigenous territory. However, a turning point occurred in April 2016 when Funai finally published a long awaited initial report that recognized the Sawré Muybu lands as indigenous. This came after the Indians themselves, frustrated by extensive delays, had marked out their own land boundaries. The federal government could overrule the constitution by resorting to special powers, created during the military dictatorship. Indeed, it used these powers to push through the construction of the Belo Monte dam, but experts say that it seems unlikely that the government will invoke that authority now, given the degree of strong organized opposition to the São Luiz do Tapajós dam." Development of Alternatives Demarcation of land for Munduruku people and other communities. The Munduruku have done their own land demarcation process. Why? Explain briefly. By April 2016 it seems that the project has been suspended by the intervention of the Funai. 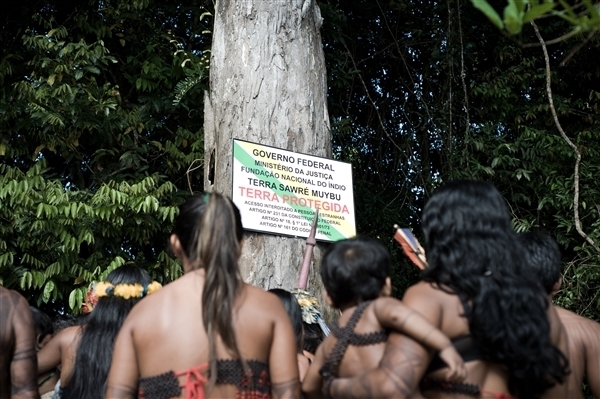 UPDATE: 04.08.16 - Ibama, Brazil’s environmental agency has denied an environmental license for the proposed 8,000-megawatt São Luiz do Tapajós dam on the Tapajós River in the Amazon — a decision seen as a victory by the Munduruku Indians and environmentalists. However, the decision will not likely end controversy in the region. The Brazilian government has major development plans for the Tapajós river basin, including 43 dams on the Tapajós River and its tributaries, ten of which are considered priority, to be completed by 2022. MANIFESTO EM DEFESA DO LICENCIAMENTO AMBIENTAL NO BRASIL. NÃO AO PLS 654/2015! 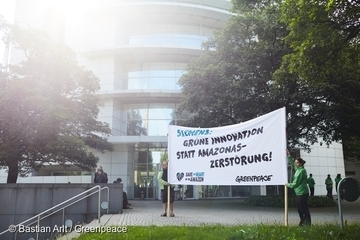 Greenpeace action at Siemens Greenpeace Germany protesters hold a sign in front of Siemens headquarters that reads “Siemens, we want innovation instead of Amazon destruction” in German.